Chogi Higa (front and center) was joined by relatives, friends and associates at the consul general’s official residence in Hancock Park. On Nov. 3, 2018 (Japan Standard Time), the Government of Japan announced that Chogi Higa and Edward A. Perron would be recipients of fall decorations. From the jurisdiction of the Consulate General of Japan in Los Angeles, Higa was awarded the Order of the Rising Sun, Gold and Silver Rays for contributing in promoting the Japanese language and the welfare of Japanese nationals residing in the U.S. In the recent past, Higa has also been awarded the prestigious Foreign Minister’s Commendation (2015) and the Commendation of the Consul General (2013). 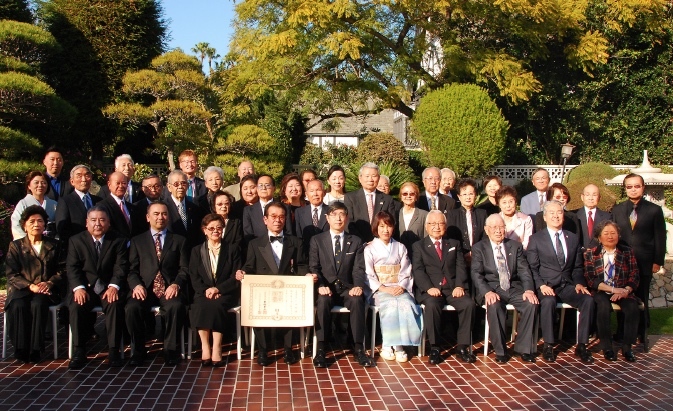 Guests to Higa’s conferment ceremony on Jan. 24 included members and officers from various Japanese American organizations, including the Okinawa Association of America, Pioneer Center, Japanese Chamber of Commerce of Southern California, and Japanese Prefectural Association. The award presentation commenced with Consul General Akira Chiba discussing of Higa’s contributions to the Japanese community, immediately followed by the traditional decorating ritual of the prestigious medal and the presentation of the certificate granted by the Emperor of Japan. Consul General Akira Chiba presented the Order of the Rising Sun, Gold and Silver Rays, to Chogi Higa. During his remarks following the conferment, Higa thanked his lifelong wife and advisor, Hiroko Higa, for her continued support through the decades as he worked full-time to support his family while dedicating a lot of his off-work hours in volunteering for various community organizations and cultural programs. He also joyfully remarked that his marriage has an interesting parallel to the consul general’s conferment ceremonies. 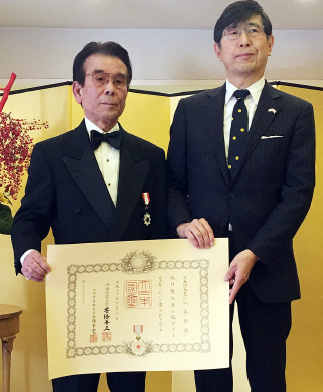 His uncle received the equivalent award in 1968, the same year that Higa got married, and the November 2018 announcement that he will be receiving the conferment marks the same year as their golden (50th) wedding anniversary. Congratulatory remarks were delivered by Mack Miyazaki, who provided additional details of Higa’s long list of contributions to the community, including leading the Japanese Prefectural Association while president in fundraising $180,000 in relief for victims of the great Tohoku earthquake in 2011. Akemi Miyake led the customary champagne toast. Both Miyazaki and Miyake are current advisors to the Japanese Prefectural Association. Following the traditional group photos with the invited guests, Assemblymember Al Muratsuchi of the 66th District, who flew in from a work-related trip to Sacramento, presented an unexpected Certificate of Recognition for Higa.